Ray Harris started a 5-year mould and tool making apprenticeship at a High Wycombe engineering company when he was 16 years old but left after two years, as much of this type of work was being offshored and he could see little future in it. He moved to a nearby subcontractor that specialised in supplying components for Formula 1 and has worked in the industry ever since, both in the supply chain and in-house for two leading F1 teams. Ray has always been interested in motorsport, having participated in various racing formulas since the age of 13, most recently intermarque. In 2015 he set up his own subcontracting company, Driven Precision Engineering, to specialise in F1 manufacturing. He rents space on the shop floor of LW&T Engineering, another contract machining firm in the Farlington district of Portsmouth. A second-hand, 3-axis machining centre was his first purchase, followed by a 5-axis model from the same supplier a year later. The latter machine extended the complexity of work that could be taken on by exploiting simultaneous 5-axis machining and allowing more efficient manufacture of standard parts by positioning and clamping the two rotary axes. To add another spindle and to increase the size of work that can be undertaken to 850 x 700 x 500 mm, his latest purchase is another 5-axis machining centre, this time a Hermle C 400 supplied by Kingsbury, sole UK agent for the German machine builder. Ray describes how he came to buy a machine costing significantly more than a 5-axis machining centre of equivalent capacity from the incumbent suppler. He explained, “It was our tooling supplier, Betta-Cut in Southampton, that suggested we look at Hermle, as the sales engineer is an ex-employee of Kingsbury and knew the machines well. “I searched on the internet and found only positive comments about the machines. Normally you can unearth some negatives about machine tools on discussion forums, but I couldn’t find any about Hermle. “Then I went to a subcontractor in Gosport, Norjon, whose owner Kevin Fox has operated 5-axis Hermles for many years and now has five. He didn’t have a bad word to say about them either, so the C 400 more or less sold itself. “Kingsbury helped by introducing us to Deutsche Leasing UK for finance and deferred the start of payments for six months from the May 2017 installation date. Working virtually seven days a week during those three months will generate sufficient income to pay for the machine over five years. It means that additional jobs carried out during the other nine months of the year will be profit and go towards the purchase of the next machine. During the close season, there are ongoing F1 race car prototypes and components to be made, work which is frequently won by Driven Precision Engineering due to the good reputation that it has established for reliability and service. However, the subcontractor has cast its net wider to serve the high-end road car, oil and gas, aerospace and yachting sectors as well, producing batch sizes from one-off up to typically 50-off. 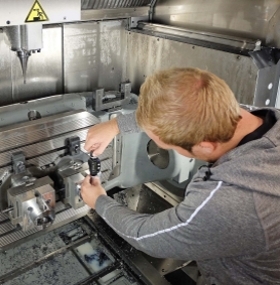 Ray added, “I try to make sure I buy only the best equipment, such as Schunk workholding and hyperMILL CAM software, as our customers expect top accuracy parts and prompt deliveries, sometimes same-day turnarounds. “The Hermle impressed me even when I was looking through the catalogue and saw the Y-axis on top of the main casting and the size of the swivelling rotary table’s A-axis bearings in the mineral cast bed. The machine performs as well as I thought it would. Every job comes out really well and blends are perfect. Such has been the success of Driven Precision Engineering since its inception two years ago that Mr Harris already has his first employee lined up to start in November this year, just in time to help him cope with the busy race car build season. Main picture: Ray Harris with the Hermle C 400 5-axis machining centre on the shop floor of Driven Precision Engineering, Portsmouth. The machine is often left to run for extended periods when he leaves at the end of the day. Above: Ray Harris checking gudgeon pin bores in a marine engine piston machined on the Hermle C 400.